Wearing t-shirts bearing slogans including "Got text?" "Make Trade Work for the 99 percent", "Don't Trade Away Our Lives," and "TPP vs. PEPFAR", TradeJustice NY Metro activists and our Washington, engaged in a silent action at a Wednesday, December 14th House Ways and Means Committee Hearing on the Trans-Pacific Partnership, a 9 country free trade agreement currently being negotiated between the United States, Chile, Peru, Brunei Darussalam, Vietnam, Australia, New Zealand, Malaysia, and Singapore. At the hearing, Deputy U.S. Trade Representative Demetrios Marantis offered testimony and answered questions from Congressmembers who wanted to ensure that TPP would not interfere with corporation's ability to continue to violate to rights of workers, addict consumers to tobacco products, and increase beef consumption, despite warnings from the UN that rising global beef consumption is among the greatest factors exacerbating climate change. On the other hand, in a remarkable display of hypocrisy, NYC's own Congressman Joseph Crowley talked about how he'd gone on record saying that he'd have voted against NAFTA if he'd been in Congress at the time out of concern for NAFTA's failure to address labor rights and wanted to ensure that labor rights would not be undermined by TPP. Perhaps Congressman Crowley has forgotten that he just voted for three free trade agreements that were strongly opposed by labor unions and labor rights NGOs, include an agreement with Colombia, the country with the highest rate of unionist killings on the planet and an agreement with South Korea that forbids reference to the International Labor Organization conventions. Despite a mixed voting record on free trade (yes on Peru and Panama, no on South Korea and Colombia), Texas Representative Lloyd Doggett posed some provocative questions, asking if the Office of the United States Trade Representative will violate US law against trying to force other country's to remove restrictions on tobacco marketing and why TPP will include disastrous NAFTA-style investor-state rules even for countries rather than relying on the federal court systems of countries like New Zealand. 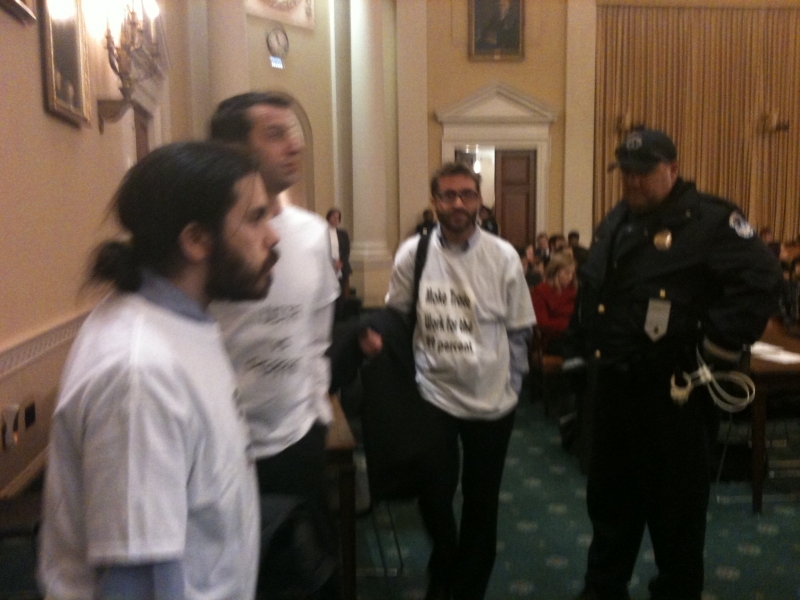 As the hearing progressed, Capitol police in the hearing room became increasingly nervous about the group wearing t-shirts in the back two rows of the hearing room. More and more police started to arrive, until there was roughly one officer for the each of the ten or so trade justice activists, each with an ample supply of PlastiCuffs. As the first panel of the hearing closed and audience members began filing out of the room, TradeJustice activists and our aliies stood silently by the exit, where our shirts were in full view of the cameras in the hearing room, the Congressmembers participating in the hearing, the audience members leaving, and those staying for the second panel of the hearing, which features testimony from Walmart's executive in charge of killing US jobs through outsourcing. View additional photos of the action here.